The ITU is holding its quadrennial Plenipotentiary Conference in Busan, South Korea from October 20 to November 7, 2014. The Plenipot, as it is called, is the ITU’s “supreme organ” (a funny term that I did not make up). It represents the highest level of decision making at the ITU. As it has for the last several ITU conferences, WCITLeaks will host leaked documents related to the Plenipot. For those interested in transparency at the ITU, two interesting developments are worth reporting. On the first day of the conference, the heads of delegation will meet to decide whether documents related to the conference should be available to the public directly through the TIES system without a password. All of the documents associated with the Plenipot are already available in English on WCITLeaks, but direct public access would have the virtue of including those in the world who do not speak English but do speak one of the other official UN languages. Considering this additional benefit of inclusion, I hope that the heads of delegation will seriously consider the advantages of adopting a more open model for document access during this Plenipot. If you would like to contact the head of delegation for your country, you can find their names in this document. A polite email asking them to support open access to ITU documents might not hurt. In addition, at the meeting, the ITU membership will consider a proposal from the United States to, as a rule, provide open access to all meeting documents. This is what WCITLeaks has always supported—putting ourselves out of business. 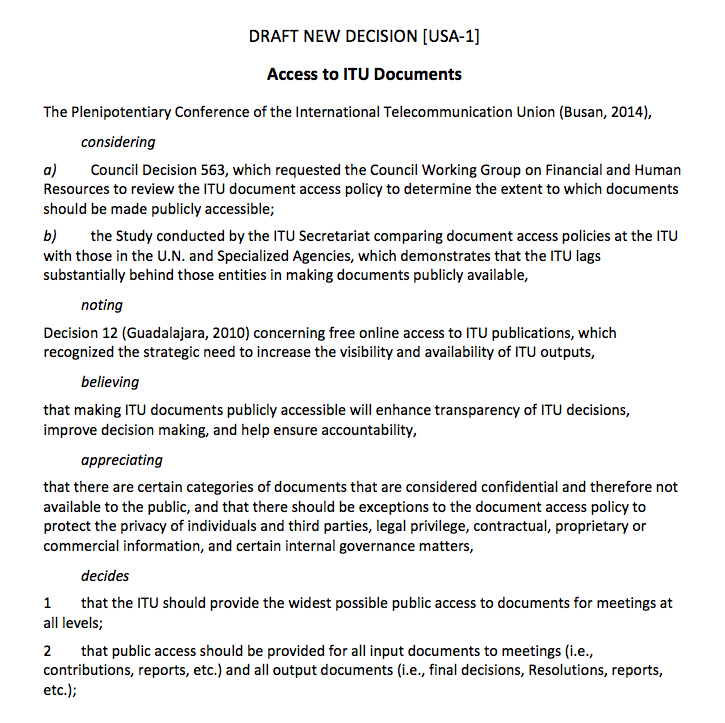 As the US proposal notes, the ITU Secretariat has conducted a study finding that other UN agencies are much more forthcoming in terms of public access to their documents. A more transparent ITU is in everyone’s interest—including the ITU’s. This Plenipot has the potential to remedy a serious deficiency with the institution; I’m cheering for them and hoping they get it right.